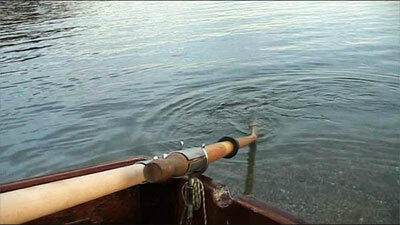 The Scullmatix is a simple device to make sculling a boat almost automatic. 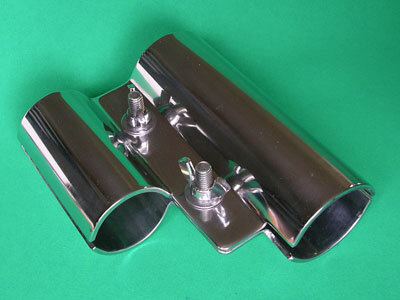 It is made from 1/8" stainless steel plate and has two 5/16" SS carrage bolts with wingnuts. It weights just under 2 lbs. It is very robust - it should last several lifetimes. Nearly a year ago, I learned of Guy Capra and his amazing automatic sculling machine. 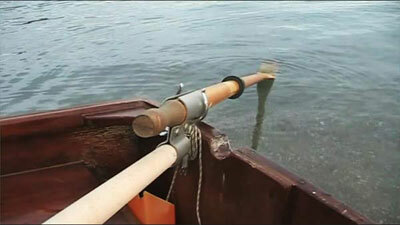 He had invented a simple device that would allow anyone to move a fairly large boat around with a single oar. You have probably seen this done, especially in movies set in Hong Kong or similar exotic locations where the natives propel their sometimes large craft with the simple use of an oar over the stern of the boat. Perhaps you tried it yourself and found it impossibly hard to do. 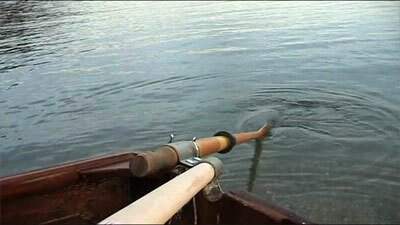 Guy's genius is that it makes the process as simple as wagging the end of the oar back and forth. Below you can see the video that Guy made after making his first prototype. As you can see from the video, he is able to propel the boat and steer it with only an oar, a wooden handle and the Scullmatix device. I immediately contacted Guy to ask where we could buy his wonderful invention but was told that there were none but his in existence. So knowing that our friends at Race-Lite were very good at making things out of Stainless Steel I suggested that we have some made here in the states and a deal was struck. So, Prototypes were made and sent to Guy for approval and when we had it right, I tested one for myself. I found it did everything it was supposed to do - even to the point of working on the little jonboat in the video below. You will notice Sandra protesting my movement because it is such a small boat. The Scullmatix really shines when used on a larger boat - like the typical trailersailer. The principal behind the Scullmatix is very simple: The offset between the handle and the oar causes the blade to turn to the proper angle to move the boat when you sweep the handle in one direction. Then, when you sweep the other way, the handle shifts the angle the other to keep you moving. It is only necessary to keep your grip somewhat loose to allow the handle to make this shift. Watch the two videos and you will get the idea. How do I set the thing up? The ScullMatix is designed to be used with a handle that is 1-1/2” (40mm) diameter, and an oar that is 1-3/4” (45mm) in diameter. This system allows you to automatically replicate the complex movement of sculling simply by alternately sweeping the handle back and forth. Furthermore it allows the use of a standard oar rather than a dedicated sculling oar. It comes with two bolts in a square base with wing nuts so you can mount or dismount quickly without tools. You will need: A wood handle about 40 inches long – a round post hole digger handle will work – and a standard rowboat oar, the length depending on your boat. • Insert the handle into the smaller side of the Scullmatix, leaving it a bit proud as shown above. • Insert the oar into the larger side of the device which should now be on top. Make sure the blade is perpendicular to the plane of ScullMatix. Now, very firmly tighten the wing nuts with pliers or a wrench. • Drop the assembly into your oarlock or sculling slot with the ScullMatix on the inside. All should easily take a natural position with the blade horizontal in water and the handle in the down position as shown below. • With the blade of the oar in the water, begin sweeping the ScullMatix from one side to the other, and so on. • Let the handle rotate freely as you sweep back and forth – this will allow the blade to naturally take the correct angle for sculling. Notice that is reverses position on each sweep. The boat will begin to move from the first sweep. When the boat reaches speed, your effort will be reduced and you will move forward slowly and surely! 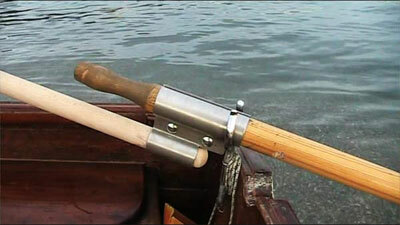 Sculling is a low power propulsion system which should preferably be used when there is little or no wind. Under these conditions, the ScullMatix will allow you to move heavy boats with ease of operation and little fatigue.